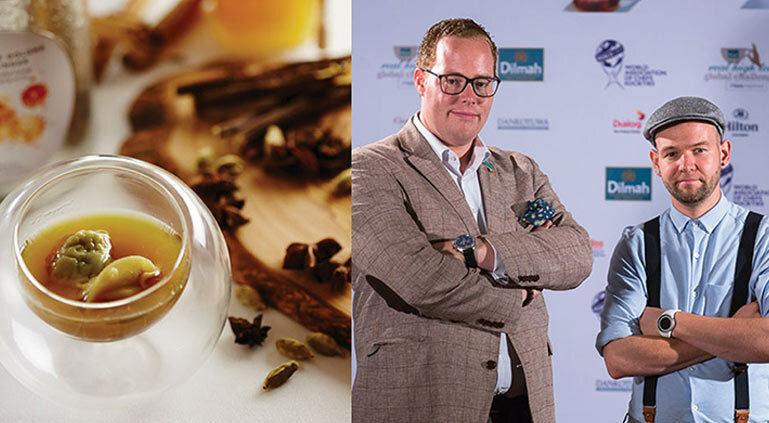 The Leaf & Artisan Challenge Trophy, symbolising the preeminence of nature – in the form of the leaf – in all aspects of the Dilmah Real High Tea Challenge, and the role of the artisan, in making the finest tea and in re-imagining tea for a new generation. 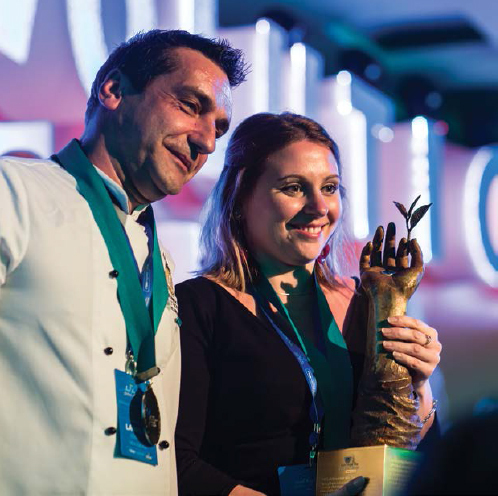 The trophy features a topaz, a Sri Lankan gemstone that is held in the palm of the artisan, reflecting the precious nature of the two leaves and bud. 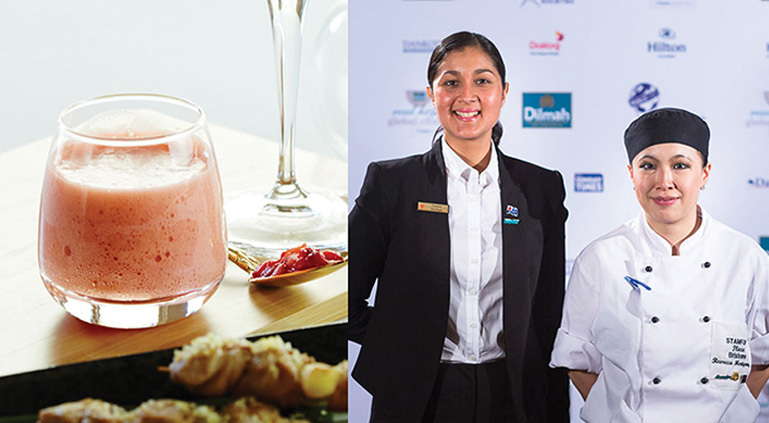 This award is presented for perfection in relation to respect for tea, and tea inspiration across food, beverage and service criteria in the Dilmah Real High Tea Challenge. 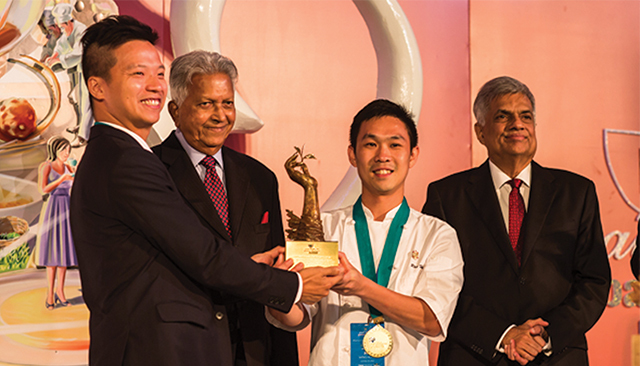 1st Overall Winner, for outstanding achievement in maintaining respect for tea and the criteria defined in the Dilmah Real High Tea Global Challenge in relation to tea, food, the combination of both and tea inspiration in all aspects. 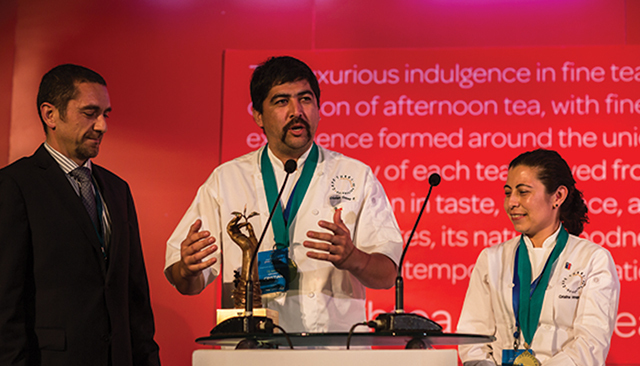 2nd Overall Winner, for excellence in maintaining respect for tea and the criteria defined in the Dilmah Real High Tea Global Challenge in relation to tea, food, the combination of both and tea inspiration in all aspects. 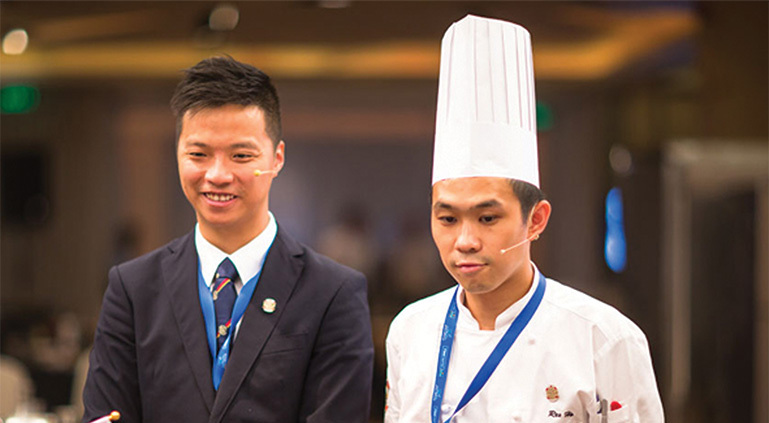 The Bernd Uber Judge’s Award, at the Dilmah Real High Tea Global Challenge, was awarded to Team Hong Kong Cricket Club (Jason Chan Yee Chiu & Ho Wing Hong) from Hong Kong. 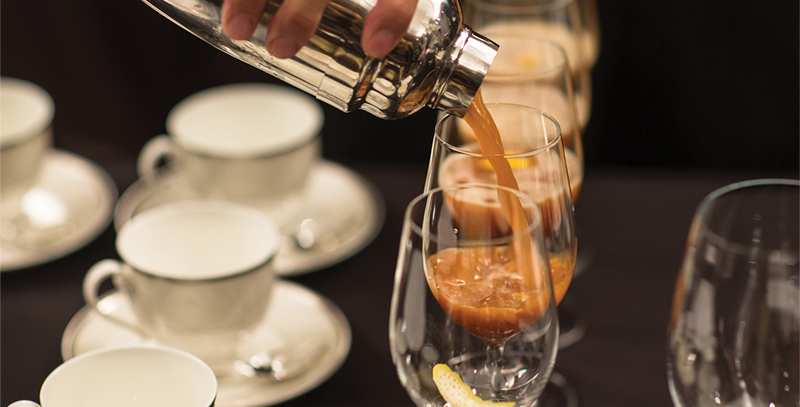 Hong Kong Cricket Club wins the Bernd Uber Award for their nostalgic ‘1997 Handover’ themed Real High Tea presented with precision, passion and perfection inspired by tea. 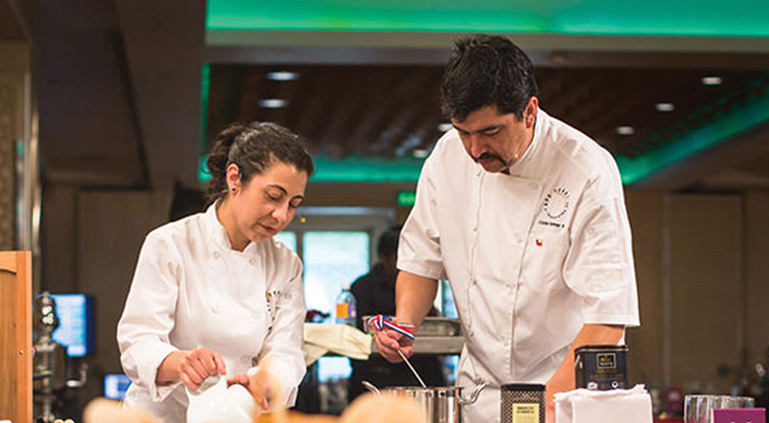 The Simon Gault Judge’s Award was awarded to Team Café Turri from Chile. Simon Gault presents Café Turri with his Judges’ Award ‘for taking high tea to a different stratosphere’. 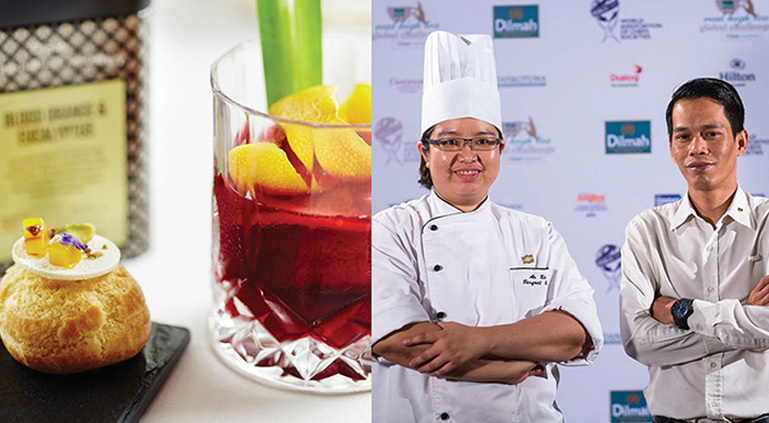 The team’s presentation at the Dilmah Real High Tea Global Challenge included a boutique beer made of Dilmah Earl Grey. 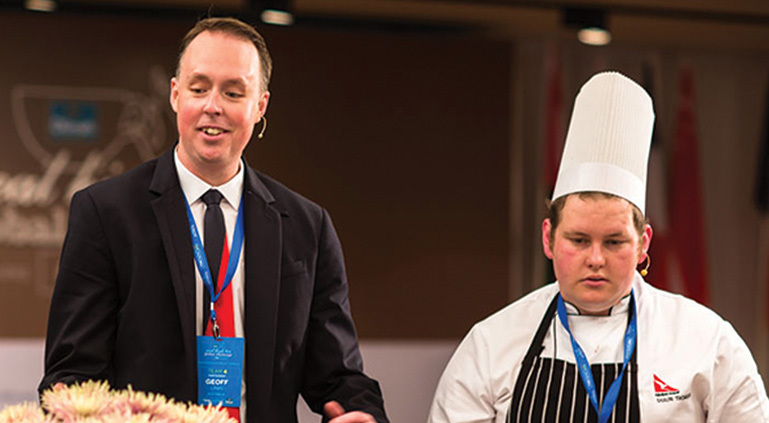 Peter Kuruvita Judge’s Award, at the Dilmah Real High Tea Global Challenge, was awarded to Team Qantas Lounges by Pullman from Australia. 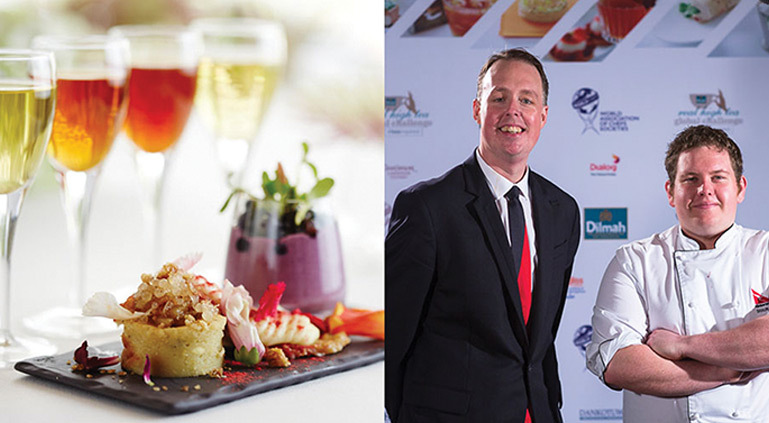 Qantas Lounges by Pullman Australia was Peter Kuruvita’s choice for the Judges’ Award at the Dilmah Real High Tea Global Challenge for their beautifully presented high tea, of which the fantastic tea and food pairings were a definite highlight. 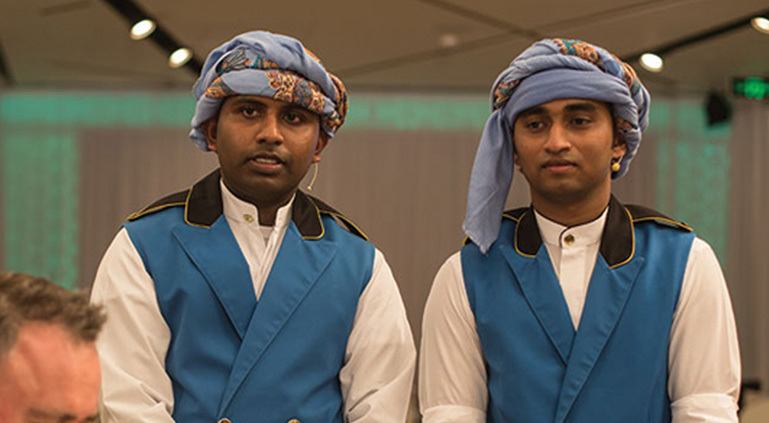 The Dilhan C. Fernando Judge’s Award, at the Dilmah Real High Tea Global Challenge, was awarded to Team Shangri La Barr Al Jissah Resort and Spa from Oman. Dilhan C. Fernando, presents his Judges’ Award to Shangri-La Barr Al Jissa Resort and Spa Oman in recognition of their well delivered sophisticated tea experience created with respect for the diverse character of tea. 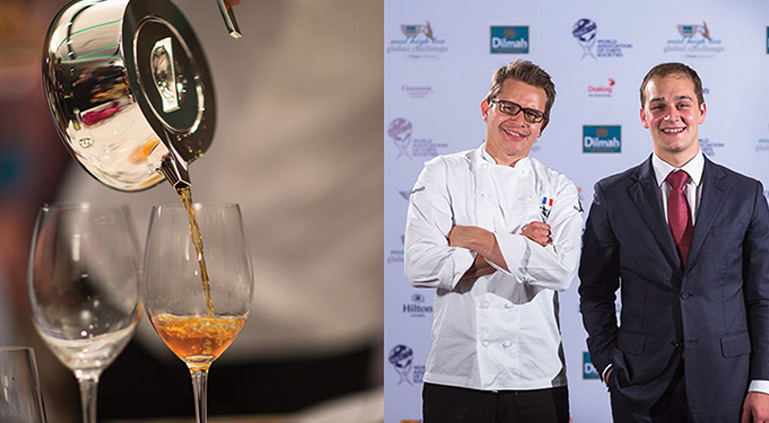 The award for the ‘Perfect Cup of Tea’ and for demonstrating respect for tea in relation to its provenance, preparation, explanation, and serving through a tea-inspired experience for the guest, at the Dilmah Real High Tea Global Challenge, was awarded to Team Institut Paul Bocuse (Thibaut Idenn and Pierre Jean Arpurt) from France. The perfect cup of tea is a celebration of tea in every sense and a tribute to the artisans who crafted it with passion and precision. 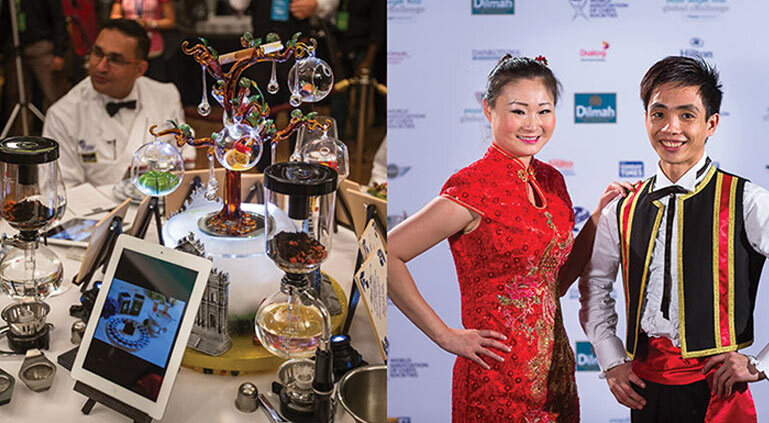 The Leaf & Artisan Trophy for ‘The Most Tea-Inspired Table Layout’ and arrangement consistent with a tea-inspired afternoon tea experience, at the Dilmah Real High Tea Global Challenge, was awarded to Team MGM Macau (Kenny Chen & Ellen Dong). 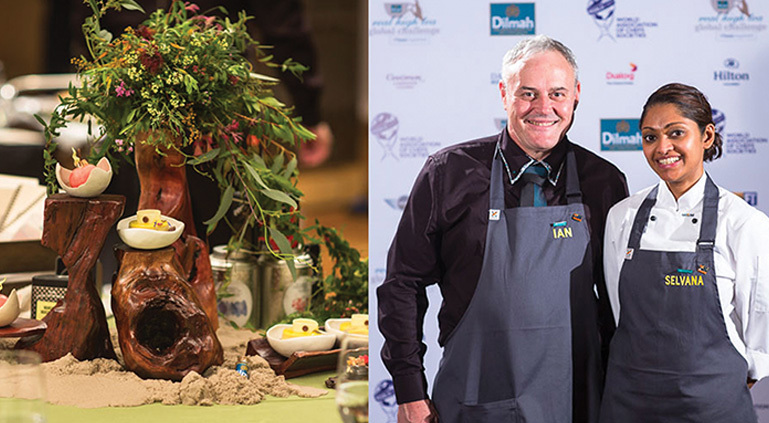 The Leaf & Artisan Trophy for ‘The Most Tea- Inspired Food’ and for the best use of tea as an ingredient in food, whilst maintaining respect for tea through its flavour, texture or fragrance as an integral component, at the Dilmah Real High Tea Global Challenge, was awarded to Team Vermeer from Netherlands (Head Chef Christopher Naylor and Restaurant Manager Erwin Essing) for their Carrot Bullion with Dilmah Springtime Oolong Ginger and Garden Pea Dumpling with Dilmah Springtime Oolong Ginger. Garden pea dumpling in carrot bouillon served with a splash of Dilmah Springtime Oolong with Ginger oil. A perfect balance of flavours, textures in harmony with tea. 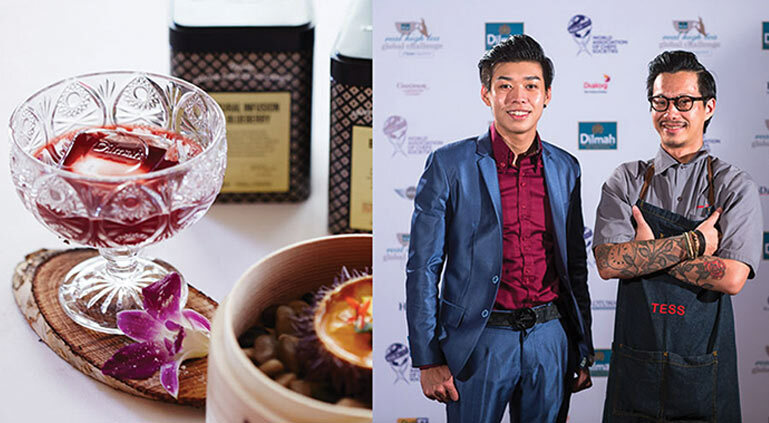 The award for ‘The Most Tea-Inspired Cocktail’ and the most inspired use of tea within the principles of mixology, in an alcoholic cocktail, at the Dilmah Real High Tea Global Challenge, was awarded to Team Tess Bar & Kitchen (Lee Zhang An and Martin Wong) from Singapore for their cocktail ‘New Age Old Fashioned integrating Dilmah Blueberry Tea with homemade bitters infusion of Dilmah Blood Orange and Eucalyptus Tea. Dilmah Apple Pie and Vanilla Tea simmered with Mao Shan Wang durian, mascarpone and Asian spices, served warm with Dilmah Jasmine Tea infused dry ice makes the award winning ‘Comfort in a Motley Crowd’. The Leaf & Artisan Trophy for ‘The Most Tea-Inspired Non-Alcoholic Cocktail’ with the most inspired use of tea within the principles of mixology, in a non-alcoholic cocktail, at the Dilmah Real High Tea Global Challenge, was awarded to Team Stamford Plaza Brisbane (Revecca Fujiwara Montgomery & Natalie Noriega) from Australia for their tea affogato using Dilmah Yata Watte Tea. A sip of this Lucuma Orange Iced Tea Affogato with Dilmah Yata Watte Tea will revolutionise the way you look at tea. Team Shangri-La KL (Adli Kasi & Yam An Nie) from Malaysia was awarded for ‘The Most Innovative use of Tea’ and for creativity in integrating tea into food, beverage or an ancillary element whilst maintaining respect for tea and demonstrating unique creativity for integrating all 30 teas in butters, marmalades, jams and other condiments in their high tea presentation. The infinite variety in tea is displayed as 30 different teas are incorporated into the high presentation from start to finish. Team Island Shangri-La (Ng Wai Kee & Ernest Wong) from Hong Kong carried home the Leaf & Artisan Trophy for ‘The Most Passionate Performance’ and the most teainspired presentation defined by enthusiasm, spirit and respect for tea in an engaging style, at the Dilmah Real High Tea Global Challenge. The legend of Brue Lee meets the legendary Dilmah Tea to inspire a passionate performance that packed a punch. The Leaf & Artisan Sustainability Award for the tea inspired presentation that most effectively integrates respect for humanity and nature in relation to food and beverage, table décor or presentation, at the Dilmah Real High Tea Global Challenge, was awarded to Selvana Chelvanaigum & Ian Jones from Team Australia for their use of salvaged wood and recycled paper in table deco and food presentation and for their use of sustainably sourced ingredients in their food and beverages. An earth-friendly tea revolution that reconnects with nature and captures the magic of rainforest, the bush, the outback and the sea in every aspect of the presentation.